I bought these shoes for my daughter, as she is going to be a bridesmaid. She is over the moon with them and says they are very comfortable to wear. Thankyou for my wedding shoes, I wasn't sure if the 7.5 would be big enough as i am usually an 8 but they fit perfectly and are so comfortable. they arrived very quickly in just 16 days which was in time for my dress fitting and made it more special. the heel is slightly higher than I thought but this is not an issue as the length of the dress is perfect and does not need taking up- saving me more money. thanks again, ill defiantly being returning and may even buy a pair for the evening to dance the night away. Again, Dress First has surpassed itself with value for money. 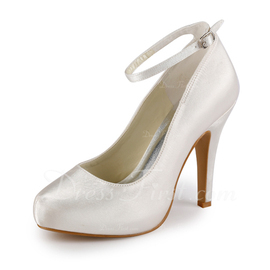 I ordered these shoes to go with a previously ordered wedding dress from them. I was unsure of buying from the internet as you never seem to get the full picture BUT for the price, I decided all would not be lost. I ordered and again they arrived in the time specified although DHL are very good at charging importation duty on top of the post and packaging already paid. The shoes are better than the picture, fit perfectly and I know I'll be comfortable in them on my special day. Excellent value for money and compliment my dress perfectly.